SharkGrip Japanese ''''cat's paw''''-type nail pullers have been the choice of professional cabinet makers and woodworkers for years because they're so effective and easy to use. Especially with the proliferation of pneumatic nailers, it's essential to have a genuine SharkGrip nail puller in your tool kit... Pneumatic nails tend to have weak heads that fold or shear off when you attempt to pull them out by the head. 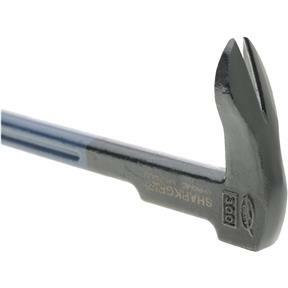 However, SharkGrip nail pullers pull from the shank of the nail, not the head. 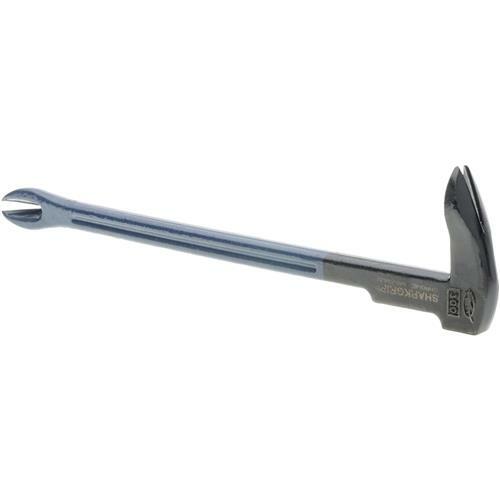 The hardened ''''V'''' of the tool (A) makes a firm, positive bite into the nail's shank removal is a snap. The underside of the puller (B) is curved, so that it can easily dig into wood, and slide under the head of an imbedded nail--or into the shank of a headless one. The back of the puller (C) is designed to double as a striking head for your hammer to make this operation even easier... SharkGrip prybars are the thinnest flat bars on the market. The tool is a combination prybar/nail puller, and it's great for prying off molding with virtually no damage to the surrounding wall or the molding itself. Its super-thin design lets it slide into the narrowest cracks imaginable. It's perfect for aligning windows and doors during installation, removing carpet strips, staples, it even doubles as a multipurpose scraper.